Trackspeed Engineering Inconel Manifold Stud Kit - $105 SHIPPED - Miata Turbo Forum - Boost cars, acquire cats. With testing at MRLS in the bag, I can finally say that I feel confident putting these on sale. Sonny (VagaXT) graciously took the crane setup off his FM manifold, put the Inconel studs in, and hammered on it for a day and a half with absolutely no issues. Group buy pricing will be $105 shipped in the lower 48. First 12 people to place orders before May 31st get GB pricing, everyone else pays retail. Tenative ship date is July 15, 2010. Normal price on this item will be $159 + ship. Last edited by Savington; 05-25-2010 at 05:20 PM. Savington, Did you ever end up putting in a session or two of driving on these studs? If we order now will it still be the 60 days or so until we get them? I will probably end up sending you money in about 2 weeks. I have to wait tell my next paycheck for some more cash. Let me know when they're shippped so I can look for them. I was never able to, but Sonny's been having the same problems for about a year now. His car is comparable in speed to my car before the v-band kit. I'm confident in his ability to put a sufficiently abusive test through the studs. Thats good enough for me. I will send in money once I have it. Should be in about 2 weeks. Picking up my Disco Potato hopefully this week. Has he done any track days since then? I am just curious about longevity of them. I will assume if he does more on them you will re measure them correct? No, no track days since the testing on the 10th and 11th. I wish it were possible. I will have him do a few more track days on them and then remove them for inspection/measurement. My biggest worry is the condition of the threads inside the manifold - orion4096's car was set up with Resbond and copper lockers and the mild studs didn't deform, but they eventually just disintegrated and blew out of the manifold. Good deal on these... If I wasn't going V-band I would be all over this. Thanks for making this happen for a reasonable price Sav. Next track day might happen before Miata Challenge at Spring Mountain on May 16th. However, I am thinking of going to either SoW or Buttonwillow before then earlier in the month. In edition to the double header at MRLS, I went two days later to a kart track and abused it on that tight but fast track, much like a faster version of an auto-x, which I would chalk up as about a half track day equivalently. Subscribed- need to see something about my setup before sending payment. Just sent you money Sav. People need to step up and get these ordered. You need to send Savington Cash money so we can get closer to getting these made. no but seriously, I'll put them into production if I can get 10 people. I have to buy a lot of these to get them down to a reasonable price. Come on guys it has been a month now. I really don't want my money back. 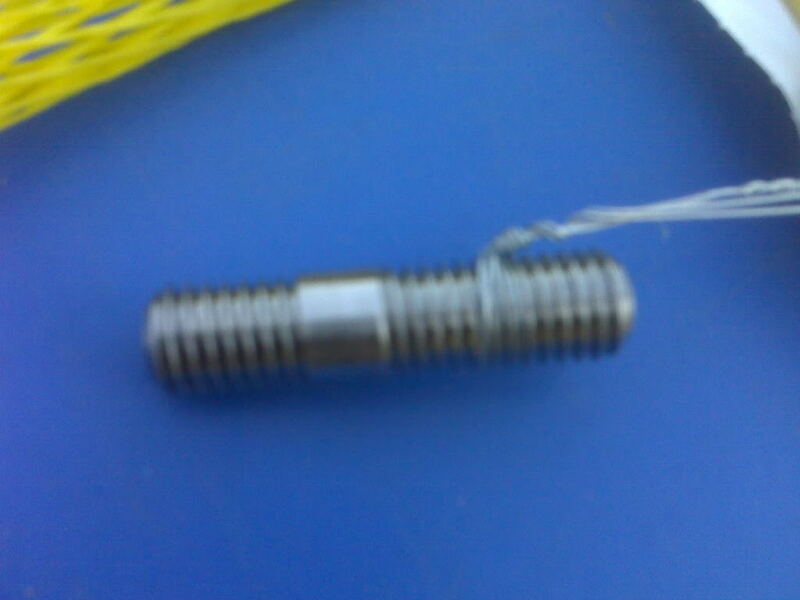 ^ What he said... you cheapskates are keepin me from inconel goodness. Not much to see, they just look like normal studs, except you can't buy them in singles for less than about $60 each. I dropped my block off at the machine shop last night. That means I have just a few weeks until I am ready for my build. Which means I need more cheap guys to get in on this group buy so that I can have my studs for my build. Hopefully I can PP cash on the 21st. I don't even have the turbo yet, but this is a good deal if it happens. I've just held off so as to not tie up cash. I want to get these made as much as you guys do. I'll see if I can float the money. If I can, I'm going to close this early and I will charge more than I was originally expecting to to make up the difference, probably ~150-160. If you're on the fence, get off of it.